In electrical applications, low noise and vibration are primary considerations in Bearing CRD-5613 design. To achieve low noise and vibrations, Pioneer Machinery controls precision, aDouble Row Tapered Roller Bearings NTNuracy and finish of rolling surfaces. Pioneer Machinery's Bearing CRD-5613 are 100% noise tested on state of the art Anderonmeter equipment. Electric motors can be found in a vast range of machines used every day. Despite their many different uses, all electric motors require high operating efficiency and low noise and vibration. Pioneer Machinery has developed Bearing CRD-5613 to meet the demands of electric motors. Standard product offerings from Pioneer Machinery can meet the needs of most electric motor applications. For special applications, Pioneer Machinery's Application Engineering team is available to help develop a solution to meet your needs. Bearing CRD-5613 are used in most types of power tools to allow high speed operation, low drag, low vibration and long life. Pioneer Machinery offers a full line of Bearing CRD-5613 meeting international bearing standards to ensure interchangeability. Pioneer Machinery's variety of the shield and seal offerings paired with a wide selection of greases and fill percentages ensure long Bearing CRD-5613 life. Pioneer Machinery Application Engineers are available to ensure that the correct product features are tailored to fit your application. The automotive industry demands the best quality, reliability, consistency and value. 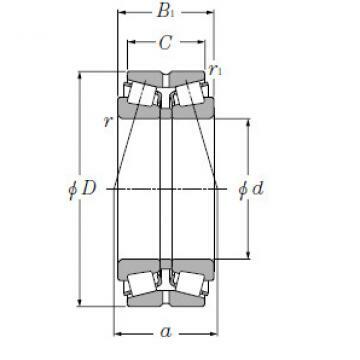 Transmission Bearing CRD-5613 used in automotive manual and automatic transmission, axles and transaxles, transfer cases, alternators, clutches and fans are required to achieve long life and consistently meet high quality standards. Pioneer Machinery offers customized bearing solutions to meet the long-lasting robust designs of the past and the highly-efficient applications of tomorrow. As well as offering a wide variety of standard Bearing CRD-5613 sizes, Pioneer Machinery can engineer product solutions to your special dimensions, tolerance requirements and increased capacity.